In my former line of work, we didn’t really have holidays. People were most likely to come to our showroom during weekends and holidays, so we were expected to be there as well–even on Labor Day, I might add. The only exceptions to the rule were the Holy Week (from Holy Thursday ’til Easter Sunday) and the Christmas shutdown. So you can imagine how much we wanted to maximize the said vacations. 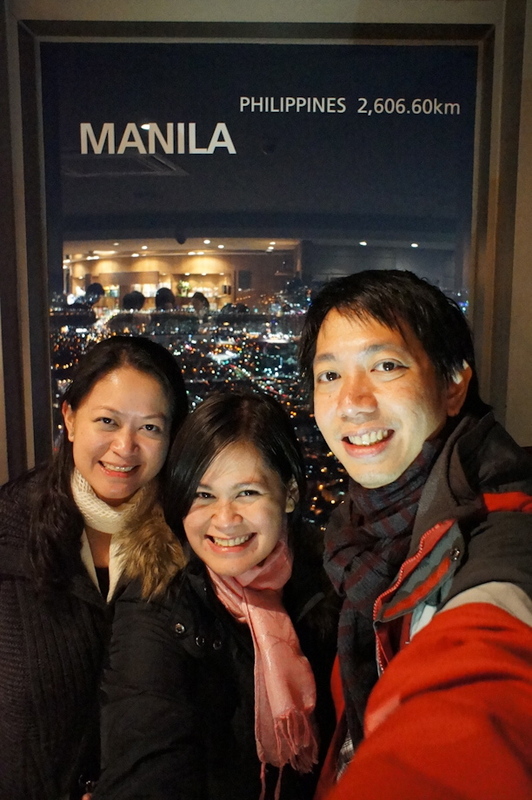 For this year’s Holy Week, Kuya (my older brother), Ate (older sister) and I headed over to South Korea for some much-needed downtime. We left Manila early Thursday morning (and I mean 1:15 AM early) so that we’d have a full day to get our bearings. Since our flight schedule was in the wee hours of the night anyway, I spent most of them sleeping–that way, I wouldn’t notice any patches of turbulence. The travel time from Manila to Seoul was roughly 4 hours, but they’re an hour ahead of us so we arrived at past 6 in the morning. 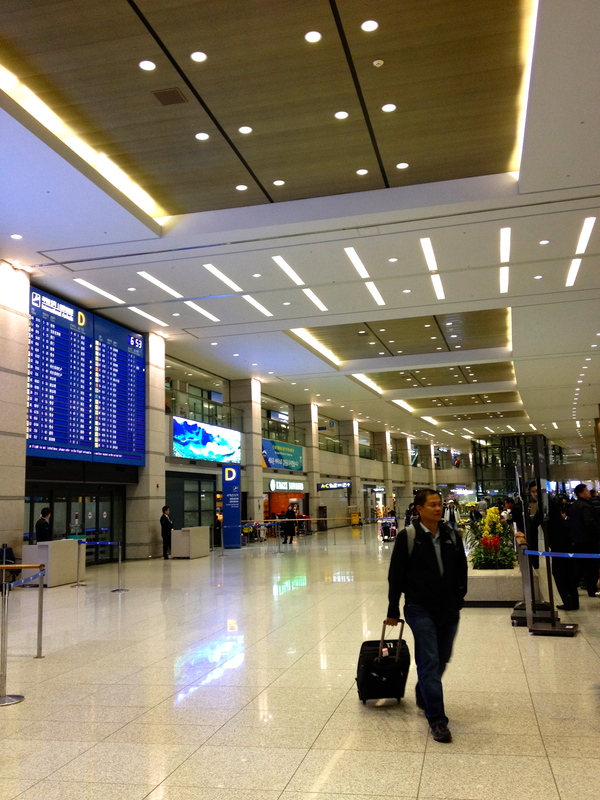 First impressions of the Incheon Airport? It was surprisingly big, modern and well-maintained. Upon arrival, we took a shuttle train to the passenger terminal, where you have the immigrations, baggage claim and customs. Thankfully, we sailed on through immigrations without a problem and decided to celebrate our safe arrival with breakfast at the main hall. My first meal in Korea! Since we were in Korea, where else would we eat but in Paris Croissant? LOL. To be fair, it’s actually a local cafe that seems to be quite popular. It also has a sister brand, Paris Baguette (apparently, there are already some branches of this in the States). We’d often see either of the two during our travels there. 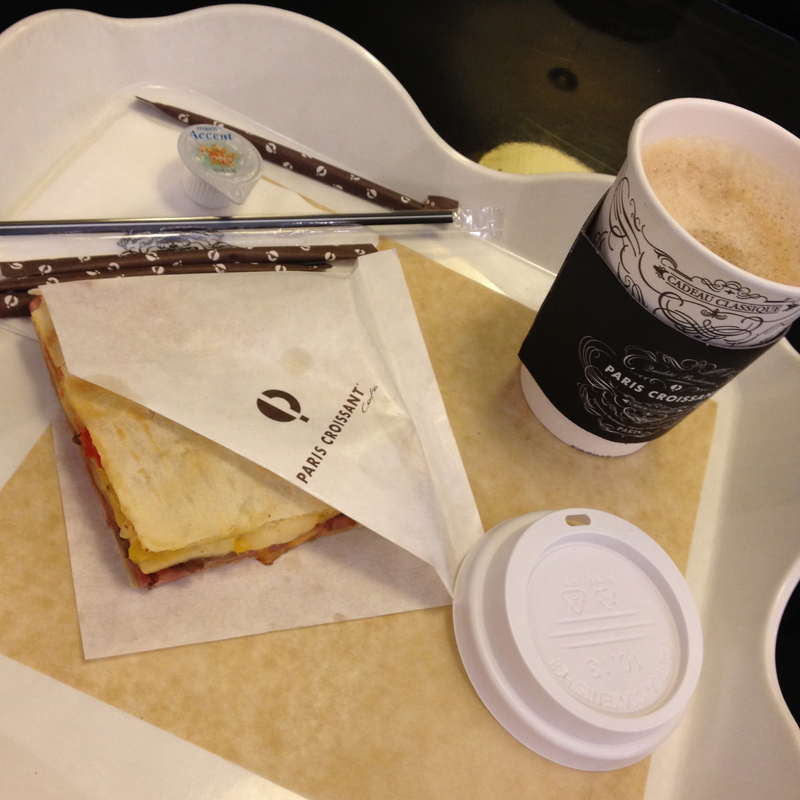 I had myself a ham & cheese quesadilla (if memory serves me right) with coffee, of course! The food was pretty good, though somewhat pricey. The currency took some getting used to–imagine your breakfast coming up to five digits! After we’d perked up our systems, we took a cab to our hotel, Hotel Victoria. Unfortunately, as we got there rather early, we couldn’t check in yet. We ended up freshening up, depositing our bags and dozing on the sofa–oh wait, that was just me! The main selling point of the hotel was its proximity to an MRT station (Miasamgeori), making it easy to go around. It was just a couple of minutes’ walk…but did I mention how cold it was? Not just cold, but windy, too! It did not bode well for our plan to see the cherry blossoms. 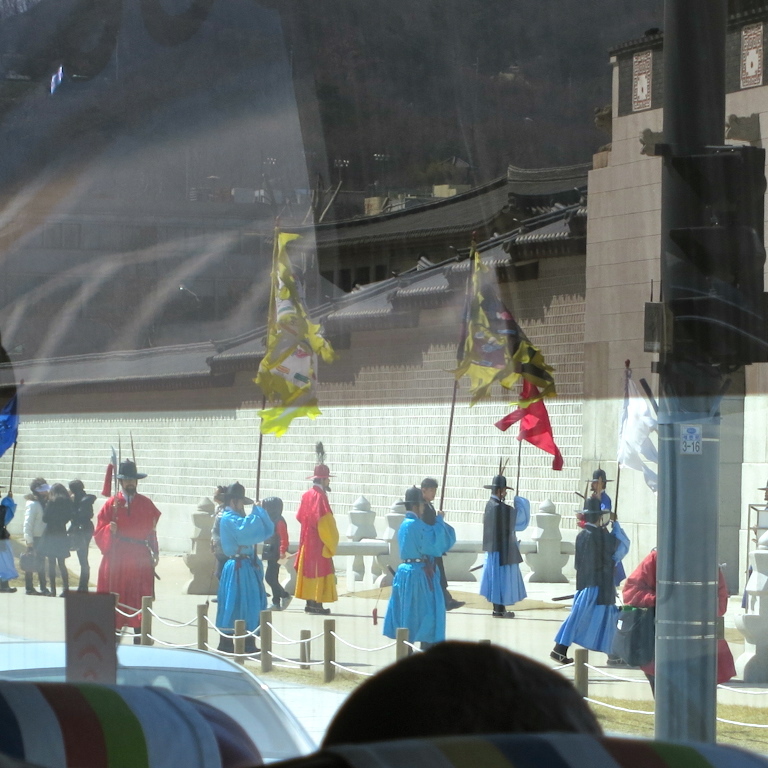 We took the train to Gwanghwamun, then walked over to the Tourism Office to purchase our Seoul City Pass Plus cards. It’s basically a transportation card but also comes with discount coupons for the city tour bus and several tourist shops/sites. The card itself cost 3,000 won, and can be topped up as needed. We also got a one-day pass on the City Tour Bus (at 10,000 won), which is good for unlimited hops on and off the bus for the day. 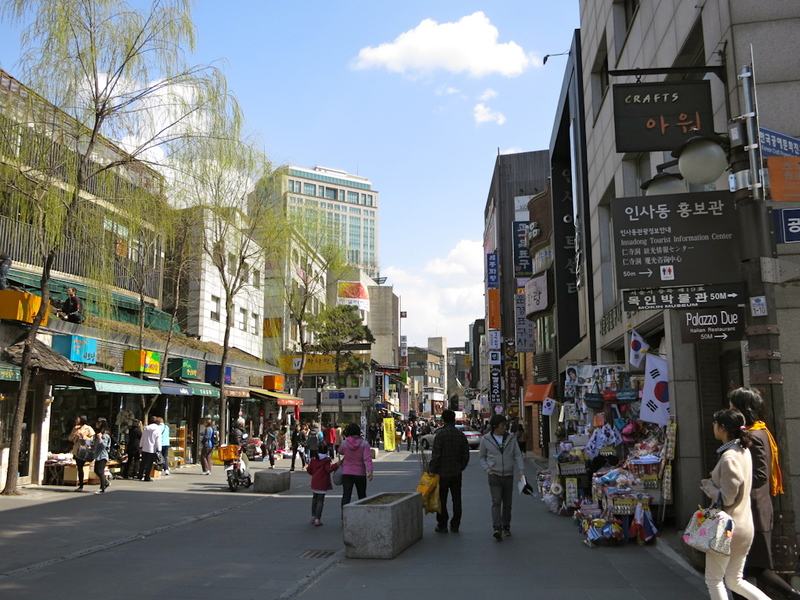 It’s a good introduction to the city of Seoul, especially if you don’t have a local guide. Each seat has an equivalent audio guide, which you can program in your preferred language. a the stops were the Deoksugung Palace (one of the five ancient royal palaces… which is actually just a short walk away from the departure point), the Korean War Memorial Hall, Myeongdong (among Seoul’s most popular shopping districts) and N Seoul Tower (more on that later!). 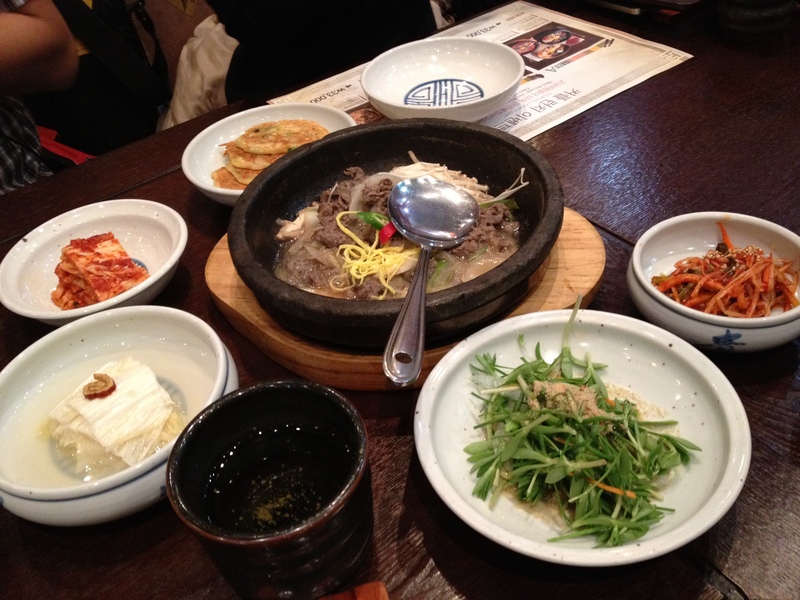 We had a lunch scheduled with Ate’s Korean colleague, Sue, so we got off the Insadong stop. 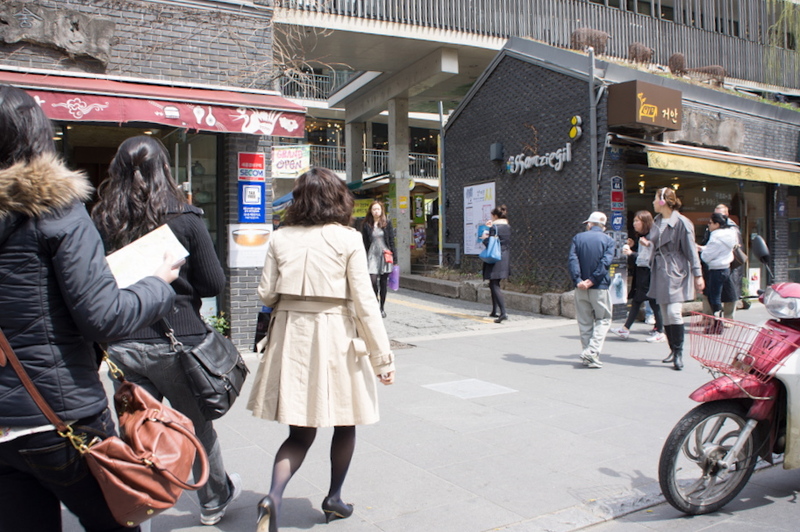 Insadong is a neighborhood full of traditional shops, teahouses and food vendors. Here you can see stalls selling anything from souvenirs to Korean handicrafts to rice cakes. 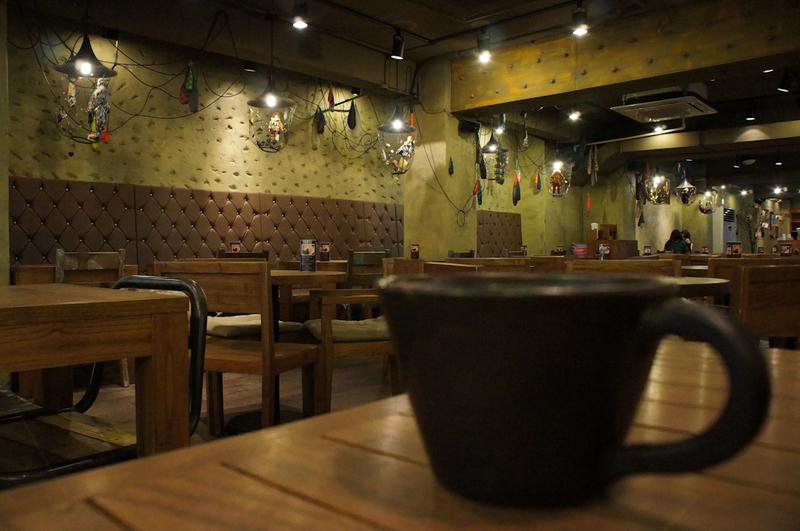 It has an laid-back, quirky feel to it, but you can also sense the creative vibe going strong. We passed by a few galleries tucked in between the myriad shops, and also encountered a jazz band performing along the way. We met up with Sue near Ssamziegil, a shopping complex within Insadong. It’s one of the major attractions in the area, and did look pretty interesting. However, we had our eyes focused on our target–LUNCH! Sue led us down a flight of stairs encased with mustard yellow walls to a restaurant called Gogung Bibimbap. This place is considered by many to have the best bibimbap in Seoul. Thus began our Korean food experience. We started off with a LOT of side dishes. Seriously, if I were a vegetarian, I’d be stuffed with just the side dishes…but then again, I’m probably the farthest thing from one. There were mostly veggies, some kind of stew and two kinds of kimchi (fermented cabbage). Yes, it was my first time to try kimchi! I remember finding it somewhat sour. Among the dishes ordered for us (aside from the bibimbap, of course) were bulgogi (grilled or pan-cooked beef) and chap chae (sweet potato noodles stir fried with veggies). I must say, bulgogi quickly became my go-to Korean dish. 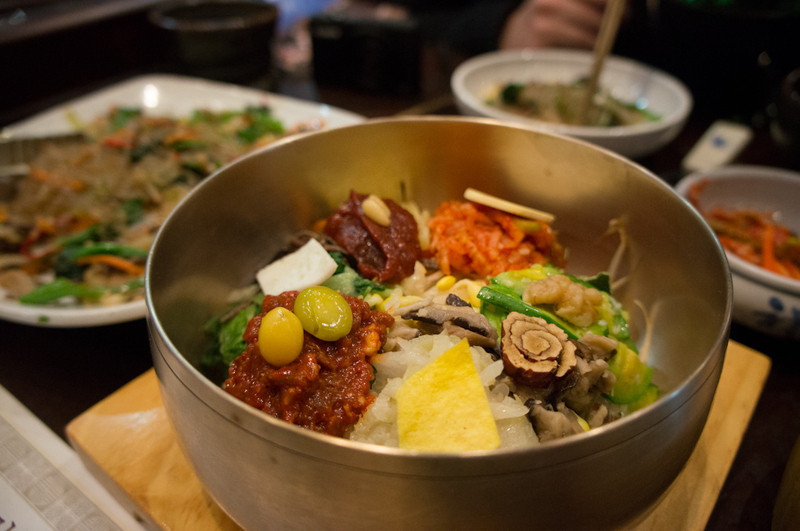 So what is bibimbap, anyway? At the root of it, it’s a mixed meal of steamed rice topped with various vegetables, chili pepper paste, meat and raw egg. There are supposedly many variations to it, so it can be as simple or as complex as you can imagine. Honestly, I was put off with the raw egg. I’m really not an adventurous eater, sorry @_@. My brother enjoyed the bibimbap, though; he’s the foodie among us. After the bulgogi, my favorite part of the meal was maesil, a sweet plum wine/tea (can’t remember which it was exactly) served after lunch. 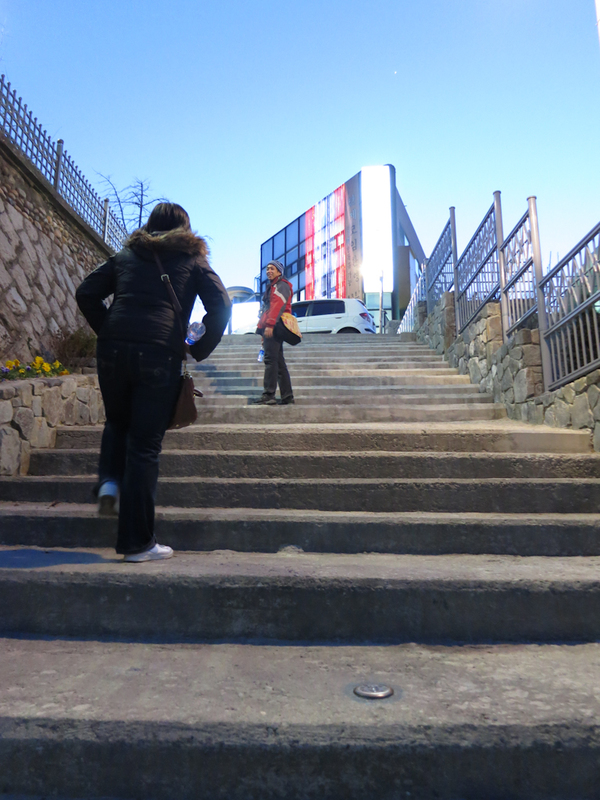 Sue had to go back to work after that, so my siblings and I just explored part of Insadong on the way to our bus stop. Hopped on back and finished the rest of the city tour. We returned to the hotel to check in to our room, then indulged in an afternoon siesta as we were all pretty tired from the traveling (I kept falling asleep on the bus!). 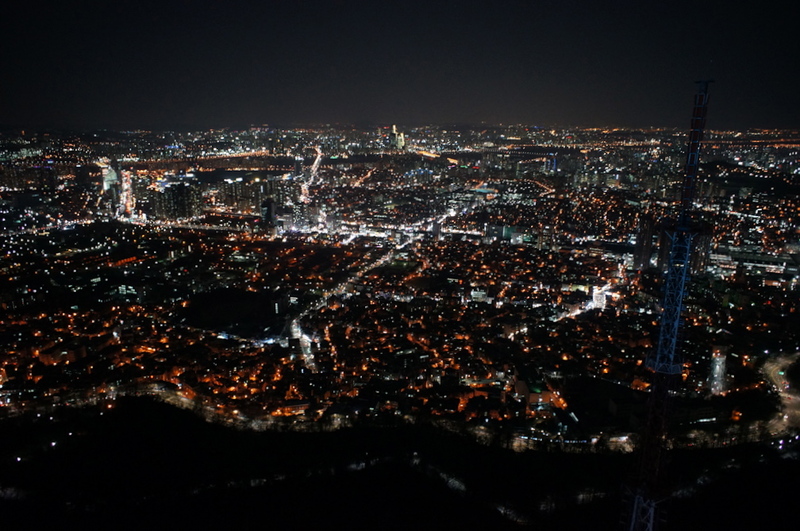 In the evening, we strapped our feet back into our rubber shoes and headed for the N Seoul Tower. We were told that the best time to visit was at night, so you can see the city all lit up and also view the laser show that starts every hour and half hour, from 8 to 11 PM. I swear, I probably do the most stair-climbing of my life whenever I travel! (Another reason to get all fit before my Cambodia trip!). I forget the exact place in Myeongdong where we walked; I just remember having to trek up a load of not-very-comfortable steps to get to the Namsan Cable Car (I just checked the site now and found that there’s actually a FREE sidewalk elevator that takes you up to the cable car base?! WHY didn’t we know that then? Argh). 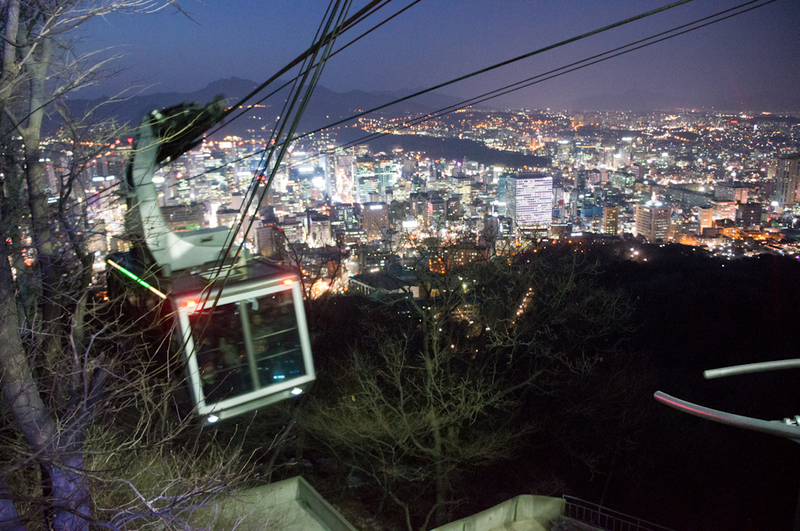 The round-trip fare for the Namsan cable car cost 8,000 won. It was well worth it, though, as it granted us a nice aerial view of the city. When we landed, so to speak, we had to climb another set of stairs to get to the tower. Admission to the observatory is 9,000 won as standard for adults, but we got it for 8,100 won, thanks to the city pass discount. The observatory is located on the third floor of the tower, at an altitude of a whopping 479 meters! (According to the brochure, Namsan is 243 mts and N Seoul Tower is 236 mts) We rode the elevator up, and they had this cool video presentation which kept us entertained for the twenty-second long ride. This sounds cliche, but the view from the observatory was really breathtaking. We walked the circumference of the floor and were awed by the endless spread of twinkling lights, blackened waters and minuscule buildings. Really, the view at the top makes the climb worth it. 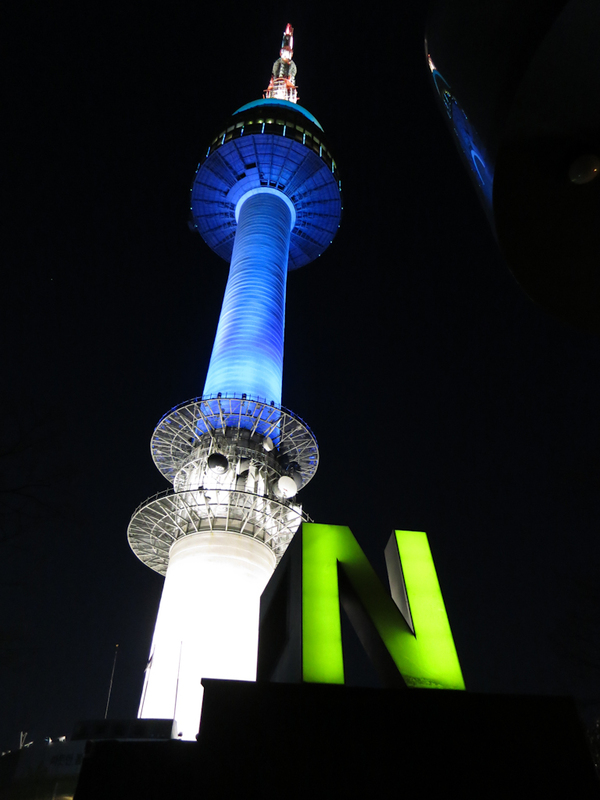 I definitely recommend visiting N Seoul Tower if you’re in town, especially since it’s become one of Seoul’s landmarks. Oh, and can I just say that Koreans seem to have a penchant for all things romantic? They have this section in the observatory called Love N Letter, where you can pen a love note and have it mailed (I just don’t know how it works, exactly–obviously didn’t try it!). 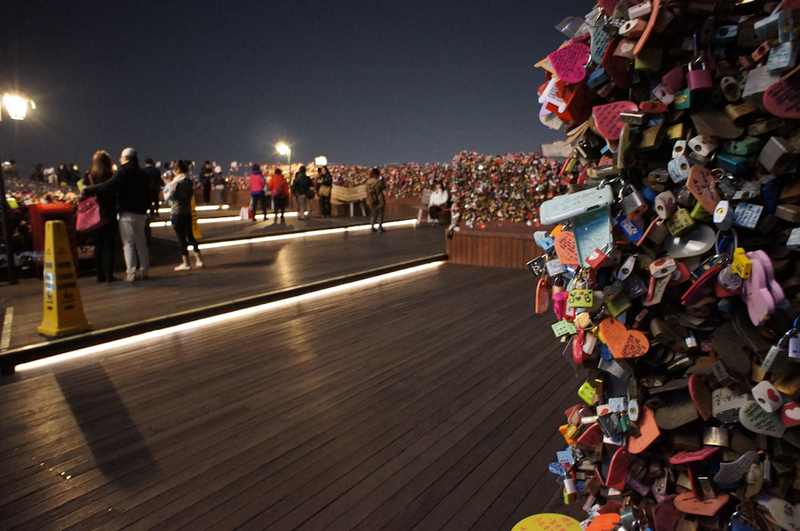 There’s also a roof terrace and lookout deck on the second and first floors of the plaza, respectively, where couples hang Locks of Love as promise of their steadfast love for each other. We waited for the 9 PM light show entitled “Flower of Seoul”. Basically, they had graphics/ videos projected onto the body of the tower–it was cute but nothing spectacular. Rode the cable car back and headed down to Myeongdong, where we met up with our cousin, who was also doing some sightseeing there, for dinner. 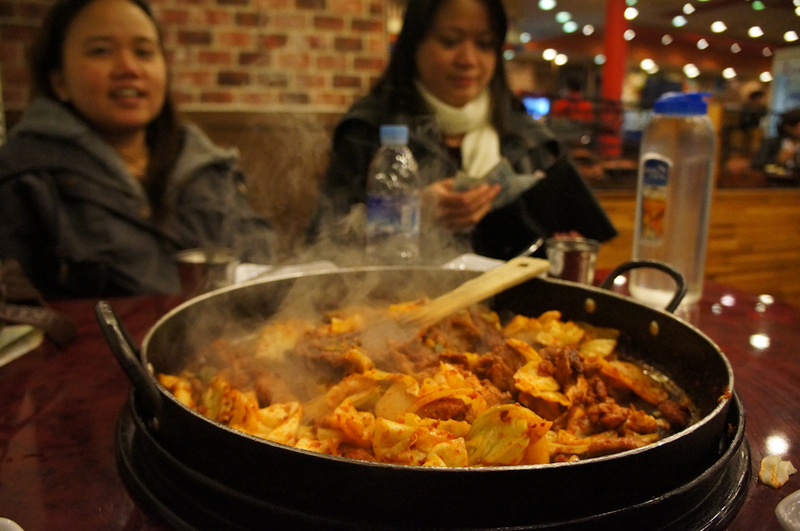 In our search for a restaurant that looked to be popular with the locals, we ended up in Yoogane, a joint that turned out to be known for dak galbi. To soothe the burn from the spicy dinner, we went to the nearby Red Mango/Cacao Green for dessert. 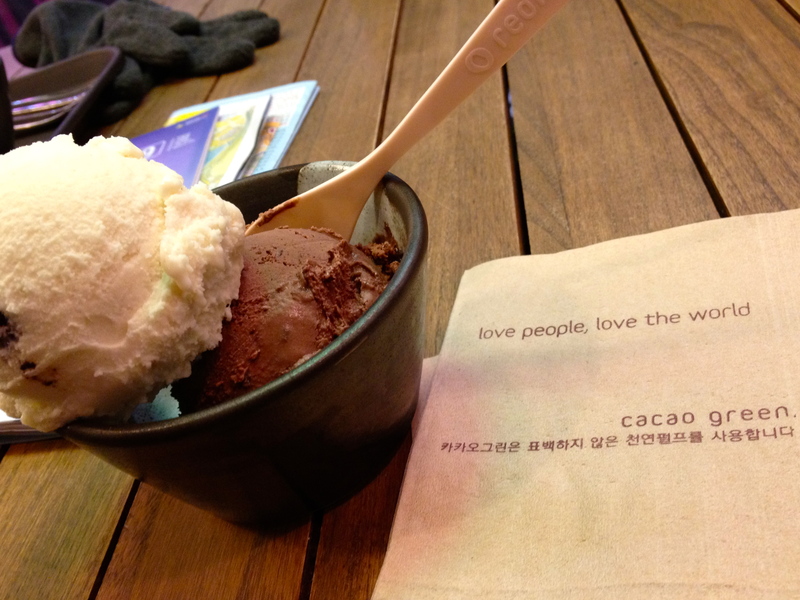 We chose that mainly because we had Red Mango back home and were curious about what Cacao Green was all about. They were actually closing up when we got there, but luckily, the manager was kind enough to give a thirty-minute extension for us. The place was lovely–all warm and cozy with exposed wooden beams and roughcast walls. In adherence to the “Love” theme that Seoul has going on, there was a wall where photos of various couples were displayed. A s for the dessert? Mmm mmm mmm. Turned out that Red Mango’s the “healthy yogurt” thing, while Cacao Green was all the organic yet delicious chocolates, etc counterpart. We wanted to try some of the cakes, but they were all out. So we ended up hot chocolates, a fudge brownie confection and ice cream (I had the ice cream). That was definitely a good call, and a great finale for our first day in Seoul.